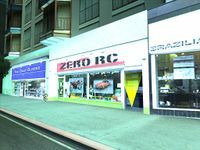 Zero RC is a hobby shop operated by RC expert Zero in Garcia, San Fierro, San Andreas. The shop is owned by an unnamed landlord up until 1992, when the landlord decides to sell the shop. Zero had been living there and knew that he would have no where to live should someone buy it. In desperation, Zero calls Carl Johnson pleading for help. CJ, having just met Zero, obliges, raises thirty-thousand dollars and buys the property, allowing for Zero to continue his residence there. This also unlocks the Zero mission strand, all of which revolve around defeating Zero's rival, Berkley. The store has several model vehicles, some of them based on the vehicles of San Andreas which includes Swat Van 92, Hydra, U.S.S. Liberty, Jester, Turismo, NRG-500, and ZR-350. The shop also has action figures of Lance Vance and Tommy Vercetti from Grand Theft Auto: Vice City, and James Earl Cash and Piggsy from Manhunt. James Earl Cash action figures.